The Garden Visit – The Report! Anticipation can bring a certain dread, a nervousness of the unknown, but the old theatre adage of it “being alright on the night” was proven true once again. 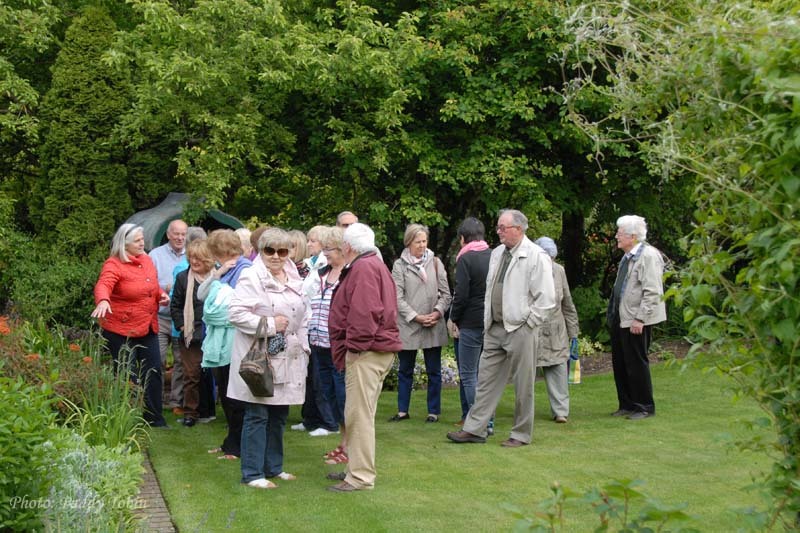 Our fellow members in the local garden society arrived at the time planned; some of the committee members arrived early and marshalled the parking – ours is a very narrow road and a certain degree of control is essential and this was done pleasantly, efficiently and with good humour, something which is most important as we would not wish to discommode our neighbours. Seeing a group of familiar faces arrive at the front gate is actually quite a pleasant experience and brought home to me that our visitors were here for an enjoyable evening in the company of their friends and that we were simply providing the location for the event. Mary took a group and walked around the garden, chatting about this plant and that, comparing notes, swapping tips and experiences while I wandered and chatted with those who had set off to explore on their own. There was tea and coffee and cakes served by our son and our neighbour and Mary was right to bake so much as nine cakes were enjoyed on the evening. Gardening, even chatting about it, gives one an appetite. We are now free for another few years!